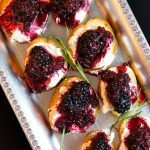 This blackberry goat cheese crostini recipe takes minutes to prepare and is the perfect two-bite appetizer paired with white wine. Preheat your oven to 400 degrees F. Thinly slice your baguette into 1/2″ rounds and lay them on a sheet pan. Drizzle with olive oil and a sprinkle of salt, and bake them four about 5 minutes, flip over, and bake on the second side until golden. Meanwhile, in small pan, combine half of your blackberries with one tablespoon of balsamic vinegar and a sprig of fresh rosemary. Simmer about 5 minutes, until the balsamic begins to thicken, and use the back of a fork to mash the berries. Remove this mixture from the stove, and pour over the other half of the blackberries. Stir to combine. Remove the rosemary sprig. It is just there to give it a burst of fresh, herbaceous flavor. Allow the toasted rounds and blackberry mixture to cool. In a separate bowl, combine the goat cheese with one tablespoon of heavy cream, zest of one lemon, salt, and pepper. The cream lightens the cheese up so that it is more spreadable. The lemon zest gives the buttery goat cheese a pop of flavor. To prepare the appetizer, spread the goat cheese over each toasted bread round. Spoon a whole blackberry along with some of the balsamic glaze over the goat cheese.